There are hundreds of municipal, regional and city public parks throughout the United States that offer some form of free Wi-Fi Internet access to the public. 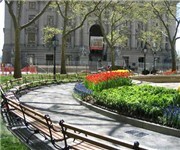 You can enjoy free wireless Internet access in several public spaces throughout Lower Manhattan. So step out and log on: surf the Web, check your e-mail, and send instant messages while relaxing in the park. the Downtown Alliance in NYC provides a number a parks with free wireless internet as part of the Lower Manhattan Wireless Network. Bowling Green Park - New York, NY - Bowling Green is located at the intersection of Broadway, State Street, Whitehall, and Beaver Streets. It is in front of the US Custom House, just north of Battery Park. Wireless service is available anywhere in this plaza. City Hall Park - New York, NY - City Hall Park sits just south of City Hall with the fountain at its center. Wireless service is available in this park. South Street Seaport - New York, NY - Wireless service is available in the seating area of the food court, located on the third floor of the Festival Marketplace at Pier 17. Stone Street - New York, NY - Stone Street is located between Hanover Square and Coenties Slip. Wireless service is strongest in the outdoor restaurant seating area. Vietnam Veteran's Memorial Plaza - New York, NY - Vietnam Veteran's Memorial Plaza is located at Coenties Slip between Water and South Streets. Enter the plaza at Coenties Slip and Water Street. Service is available anywhere in this plaza, but strongest in the vicinity of the fountain. 60 Wall Street Atrium - New York, NY - Service is available anywhere in the spacious indoor public plaza located at 60 Wall Street. Winter Garden - New York, NY - The Winter Garden is located in the World Financial Center, between buildings 2 and 3. Wireless service is available anywhere in the two-story, indoor plaza. Below is a list of popular public parks that are currently offering free Wi-Fi.Do you know more parks with free wireless? If you are looking for kid friendly public parks check out Kids Play Parks. If you are looking for dog friendly parks check out Doggies Welcome.